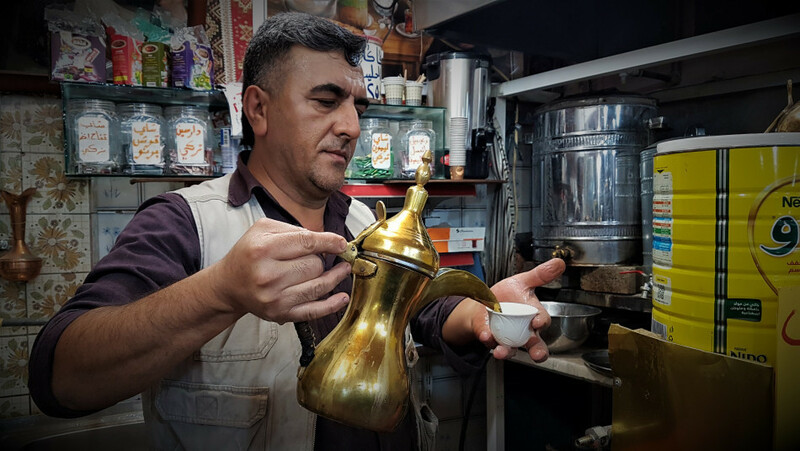 Khalil’s coffee shop in Kirkuk’s Qorya market is renowned for the unique Turkish tea it serves which is known as “Muhammad Afandi”. This is not the only thing unique about this place. The coffee shop has become a meeting place of the city’s diverse communities having chitchats and playing dominos and backgammon while sipping a cup of “Muhammad Afandi” tea. Kurds, Arabs, Turkmen and Christians flock to Khalil’s coffee shop which was opened 4 years ago. Visitors from all walks of life praise the different, yet outstanding taste of the tea which Khalil serves every day from dawn until sunset. Khalil Chaychi also known as (Abu Zainab) says he serves the tea in different flavours such as ginger, Turkish lemon and cardamom.